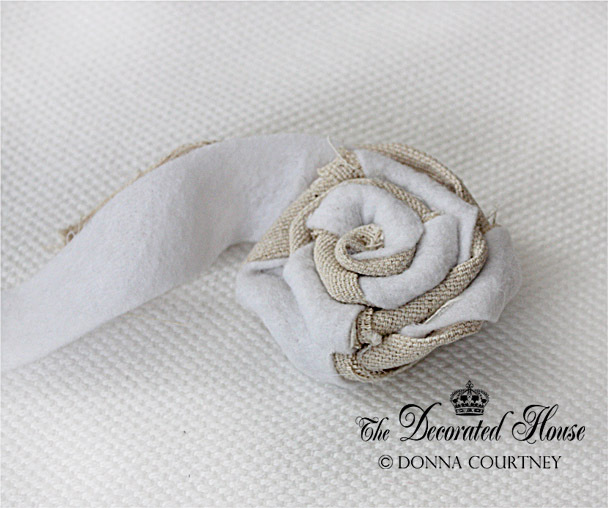 with two different pieces of fabric, and then just do the same twist and roll as in the other rosette. In this case the linen fabric is twice as wide because it is folded in half. When it is folded it is then the same width as the white felt. 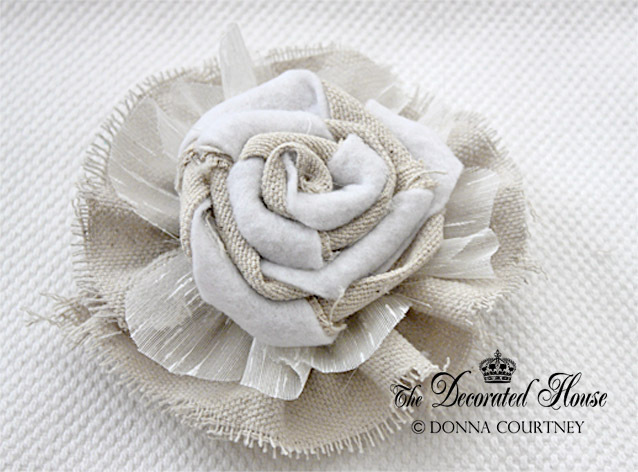 Before you begin to make the rosette, you want the two fabrics to be the same width. The length doesn't matter as much because you can cut off whichever one ends up being longer. The rosette is stitched or glued to the bottom layers. Again you can add a lovely button or rhinestone to the top if you like. Hope you have fun creating some of these for yourself. Beautiful!! I need to try this! Thanks for sharing. That's beautiful, Donna! Who would think that twisting fabric could produce something so pretty. I love the two-tone look. I love the fabric flowers. Different and creative never saw it before. Very pretty. This is so pretty! Thanks for sharing how to make them! Love the two tone...I will be making some! I wish I could figure out how you made the ruffle on the bottom of the rosette? Jamie, it is just a piece of the same cotton fabric used in the flower, with a loose basting stitch (by hand if you don't use a sewing machine.) Then unravel the edge of the fabric, and pull the basting stitch tighter to make a circle.